Sheriff Hayden Duke was born on the Pilgrim, and he expects to die on the Pilgrim, like his father, and his father before him. That's the way things are on a generation starship centuries from home. He's never questioned it. Never thought about it. And why bother? Access points to the ship's controls are sealed, the systems that guide her automated and out of reach. It isn't perfect, but he has all he needs to be content. Until a malfunction forces his engineer wife to the edge of the habitable zone to inspect the damage. This publisher's pack contains Commando and Guerrilla, the first two books in The Royal Marine Space Commando series. Commando, Book 1: A young lieutenant. A fleet of alien invaders. Will first contact be humanity’s last stand? Guerrilla, Book 2: A ruthless invasion. An outmatched colony. A Commando's last chance offensive. 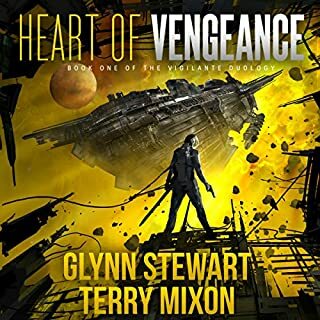 If you like fast-paced action, interstellar battles, and characters with nerves of steel, then you’ll love Jon and James Evans’s thrilling saga. 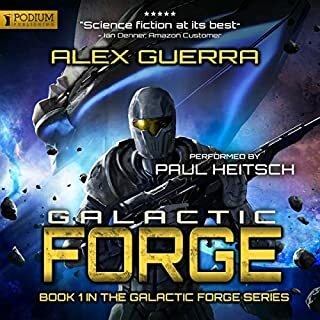 To protect his young family from merciless corporate tyranny, Samuel Hyst signs up for the hazardous life of a salvage marine, the foot soldiers of a militarized deep space operation. 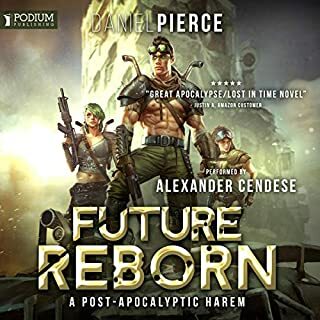 Hazard pay is high for a reason, and Samuel must endure grueling tours of duty in the abandoned scrapyard quadrants of a war-torn universe. Endless wars rage across every galaxy, leaving damaged starships, rusted factories, and broken planets in their wake, all ripe for plunder by the desperate and the daring. Samuel must seize his destiny in frenzied combat against murderous scavengers, horrific monsters, and the elite mercenaries of rival corporations. Left with no choice but to fight, he must win freedom with a combat rifle and his blowtorch. This is a dystopian society. The universe is run by corporations. The corporations race to different planet systems and strip them of all their useable resources. The corporations war with each other. Most people barely survive. Everyone is required to get an education, but are required to pay for it. Coming out of high school they have huge debts, they owe to the corporation that owns their planet. It is a system similar to the old mining towns where you owed your sole to the company store. The corporations decides upon your graduation what job you qualify for, limiting your chance to pay them back. A last ditch option is to go into the military which pays a little better. While this is an old theme, it is one I enjoy reading about. THERE ONLY TWO KINDS OF PEOPLE, THOSE BEHIND THE GUN AND THOSE IN FRONT OF THE GUN. I already gave you the first half hour, after that it is purely military fire fights. Fighting for a company you hate, but THIS IS THE JOB. By the looks of the cover, I thought there would be a lot of tech type weapons and body armor. There is some, but it is mostly fight scenes. I lost interest. Kafer is a top notch narrator and perfect for this type of book. In a universe where everyone is ruled by corporate oligarchies, who charge you for mandatory education and then slot your job afterward to fit the corporations needs, there aren't too many choices to avoid a life of drudgery and debt.One of the few choices outside the job slotting are the Reapers, the Salvage Marines. These combination salvage crew/soldiers go where the corporations sends them, salvaging wrecks, fighting off squatters on corporate property, and fighting off the aggression of other corporate entities. This is the life Samual Hyst finds himself in. He took the job to be able to provide for his wife and young son. The pay is excellent, allowing him to pay off his childs life debt, and work on paying off his own and his wifes. The job is ridiculously dangerous, and the Salvage Marines, while well trained, are given surplus weapons and armor, so they are not considered frontline troops. They have to take on any mission though, so they do, and they grow into family as any good military unit does. The characters are very well drawn out, and I became emotionally attached in what happened to them. The settings are extremely varied, from their homeworld to various ships to a variety of planets. The pacing is fast, with no lags in the actions, and the dialogue is crisp. Anyone who likes Mil SCi Fi should enjoy this series. As always, Jeffrey Kafer does an excellent job bringing the story to life, really nailing the various characters nuances. I was given a copy of this book free of charge by the author, narrator or publisher free of charge in exchange for an honest review through Audiobook Boom. Fast phase but it does occasionally get bogged down in repetition. Action and a quick read between monster sized epics. I wish the book was slightly longer to stretch out some interactions between the leading characters . I received a free review copy from the narrator courtesy of AudioBookBoom. The world that Sam lives in would be the definition of living to work. You are basically born into debt and work your entire life and can never get out. 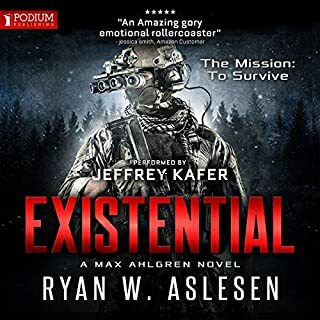 Faced with hard decisions about his future and the future of his unborn son, he enlists with the salvage marines in an attempt to break free from the corporate tyranny. 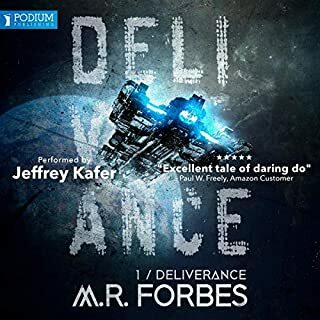 Jeffrey Kafer is great in the narration of Salvage Marines. He has the perfect voice to keep the action moving in this story. Kafer has one of those voices that make a scene more believable. If you are a fan of action, then this book is definitely for you. This feels almost like a Michael Bay movie written out. There is a lot of fighting in different areas, planets, and interstellar ships throughout with very little dialogue (just enough to move the story forward). There were a few parts that felt like they were just thrown in there to stir things up without actually moving the story along. But, it also didn't really take away from the story either. The sub-plot about the corporate tyranny was my favorite part of the novel. I would love to see more about this. Argo did a pretty nice job setting up the dependence on the company and it was a running antagonist that weaved in and out of the story. But it was definitely the part that kept me intrigued. My biggest complaint was the choppiness of the story. It felt like Argo wasn't sure what to write about between different missions so it just kind of bounced from one mission to the next and the years just kind of skipped by. I know that it wasn't meant to be a long-winded narrative or anything, but I think it could have used a little more "cool off" time between each new battle. Overall, Salvage Marines was a really good Space/Sci-Fi non-stop action novel for those of you who like their books to be action packed! This book was given to me at no charge, in exchange for an unbiased review via Audiobook Boom. If you want to see more reviews like this, please check out BriansBookBlog DOT com. This book was dark, grim and kind of fatalistic. Action packed it was never boring. Loved the characters and the story. Very well done. Awesome narrator. He did a wonderful job. It's a good story and I liked it. Lots of action, but... It's a shorter story and not worth the price for the audible version. What did you love best about Salvage Marines? If you are a fan of action, then this book is definitely for you. “Salvage Marines: Necrospace, Book 1” is a militaristic SciFi novella set in a bleak future where a few monolithic corporations also serve as governments. People are forced to receive an education, but they must also pay for their education. Thus everyone who doesn’t come from a wealthy family starts out life with a debt that usually last that person’s lifetime. Work and careers are determined by a placement test, the results of which are almost absolute for the test taker. The only other avenue available for the average citizen is to join the salvage marines, which are a militaristic force run by each individual corporation. The salvage marines are used to do anything and everything from reclaiming useful materials, abandoned facilities and even planets. Many times the salvage marines are assigned to theses tasks in areas that are inhabited with hostile forces that can range from rival factions to indigenous alien life. Because the jobs are incredibly dangerous, the pay is incredibly high. The trick is to survive long enough to pay off one’s debt. Author, Sean-Michael Argo does only the bare minimum on character development. The book is written like a series of action vignettes with some down time between them. Narrator Jeffrey Kafer has a good voice and did a solid job as well. 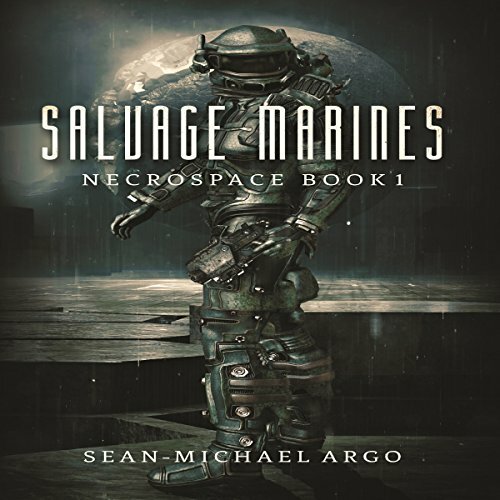 Overall, I enjoyed “Salvage Marines: Necrospace, Book 1” more than enough to pick up book 2. Finally, this audio book was provided by the narrator at no cost in exchange for an honest review, courtesy of Audio Book Boom. I received this audiobook for free through Audiobook Boom for my unbiased review. 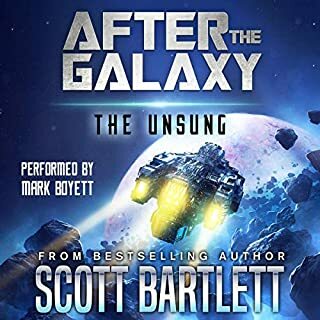 I've read the series and enjoyed it the audio book is great well worth getting.